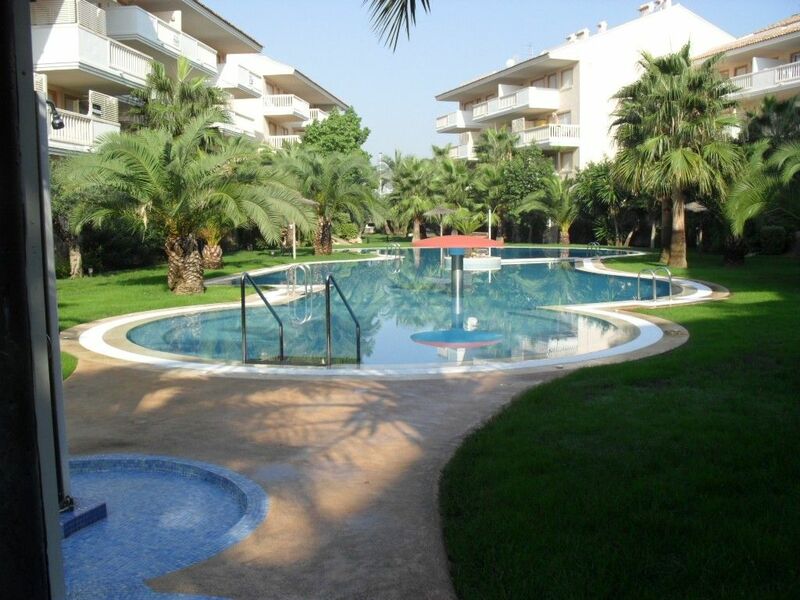 An exclusive, luxury three bedroom apartment situated inside a gated marina development. The apartment is fully equipped and situated only 2 minutes walk to the beach El Arenal, bars and restaurants. Secure complex with private pool, gym, tennis court, squash courts, bar and restaurant, private marina and under ground parking. Fully air conditioned, satellite TV and video. Security key access. Many attractions surround the complex, including the local markets, scenic walks, jet-skiing, Javea port harbour. Also attractions such as go-karting, theme parks and water parks within a short drive. The locals are very friendly, many speak a variety of languages and are very helpful. If you have any questions please feel free to contact me. Golf courses: Golf is readily available with two top quality courses in Javea. Javea golf club and la sella golf club,(course designed by Seve Ballesteros). There is also a good selection of courses a short drive away. Feature and lesuire parks: Terra Mitica - Spains answer to Disney World, Aqualandia water park. Mundamar animal park. Safari park and go karting. 1 double bed, 2 singles and bunk-beds, close to all amenities, 30 minutes from Benidorm, Terra Mitica Spain’s Disney world, safari park, 10 minutes from Denia crossing point to Ibiza and Palma. Javea is a perfect setting for a family Holiday, The apartment was spacious for the 4 of us with good mod cons. On arrival we found the apartment clean and tidy with a well kitted out kitchen. The pictures don't do the apartment justice it is much nicer than the pictures suggest. Nou Fontana complex has a great pool with grass surround, ideal for those lazy days. The apartment is also perfectly situated for Javea's sea front with the beautiful sandy beach, great promenade and quality restaurants. Rented apartment for 2 weeks in July/August for family holiday. Owner was very helpful, answering all questions and providing information prior to and after we made our booking. Arranged for his father to meet us in Javea to let us into apartment and show us around. The apartment itself was more than adequate for family of 5 with 3 boys under age 8. Plenty of room both inside and out with very good sized and private patio area ideal for eating. Air conditioning worked well and was hugely welcome in the heat of the summer. The pool at the complex is excellent with a good shallow end for kids and plenty of space for the adults too. Above all however is the fantastic location of the apartment on a quiet road next to the marina (although no view) and a 5 minute walk from the busy but excellent and very child friendly Arenal beach and bustling promenade with its wide selection of restaurants and bars. We thoroughly enjoyed our stay and would recommend this accommodation. We have stayed in this apartment many times over the last 10 years and just love it. We are a family of 5 the children are now teenagers and still love staying here. the apartment is spacious and comfortable with air conditioning which is a must, the pool is immaculate and never too busy, the beach is only 5 minute walk away. Javea has plenty bars and restaurants also good shopping the locals are very friendly. We have visited Benidorm Teramitica Park and Water Parks several times also have visited Valencia well worth a visit. I would recommend this apartment to anyone both couples and families will love the apartment and the area. This was our first visit to Javea & we had a great time. We were after a relaxing 2 weeks & that was exactly what we got. The accomadaton was excellent with all the facilities you need. There were 4 of us so was very spacious but would easiy cope with 6. We made lots of use of the pool area. The pool itself was very big and surrounded by well established palm trees to provide some welcome shade at times. Our 2 girls spent a great deal of time in the pool. The walk to the sandy beach took about 5 minutes. There are various activities available including an offshore pontoon to swim out to & pedalos for hire. In front of the beach is a promenade with lots of restaurants that you can eat in whilst enjoying the view allong the beach or out to sea. La résidence est idéalement placée, à 5 mm de la plage et du remblais tout étant relativement calme. Elle offre des prestations de très bon niveau avec son terrain de Padel, sa salle de fitness et surtout sa piscine, très bien dimensionnée, surveillée par un maître-nageur et qui se transforme en méga-jacuzzi au moins 2 heures par jour. L'appartement offre tout le confort : une climatisation performante, la WIFI (parfois un peu faible), de quoi faire à manger sans problème. Il se situe en rez de jardin, ce qui permet de bénéficier d'un espace extérieur assez important (terrasse sur toute la longueur et cour en contre-bas). Seule ombre au tableau, la douche de la salle de bain des "parents" : dans une pièce entièrement carrelée et spacieuse, on trouve une douche en demi-rond de 70 cm, avec un rideau de douche installé sur un portant en éventail, totalement inefficace et très désagréable. Mais je suis sûre que le propriétaire, charmant et très réactif saura trouver une solution à cette unique réserve. Javea is situated between Alicante and Valencia. referred to as 'The Jewel In The Crown'. bathed by the Mediterranean sea, sheltered by Mount Montgo. divided into 3 areas, old town, the port and El Arenal beach.